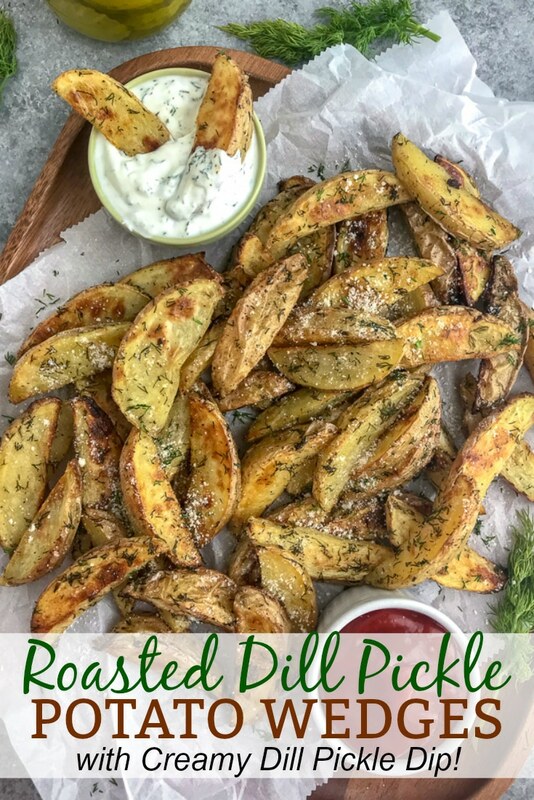 If you’re a dill pickle lover, then this Roasted Dill Pickle Potato Wedges recipe should be the next item on your list to make! 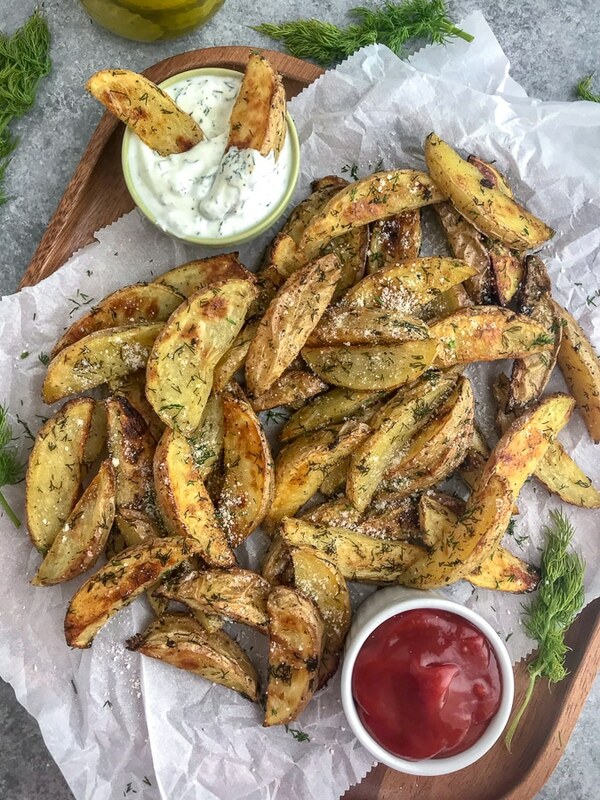 Potato wedges that are perfectly crispy on the outside while being flaky and tender on the inside, with a hint of dill pickle flavors. 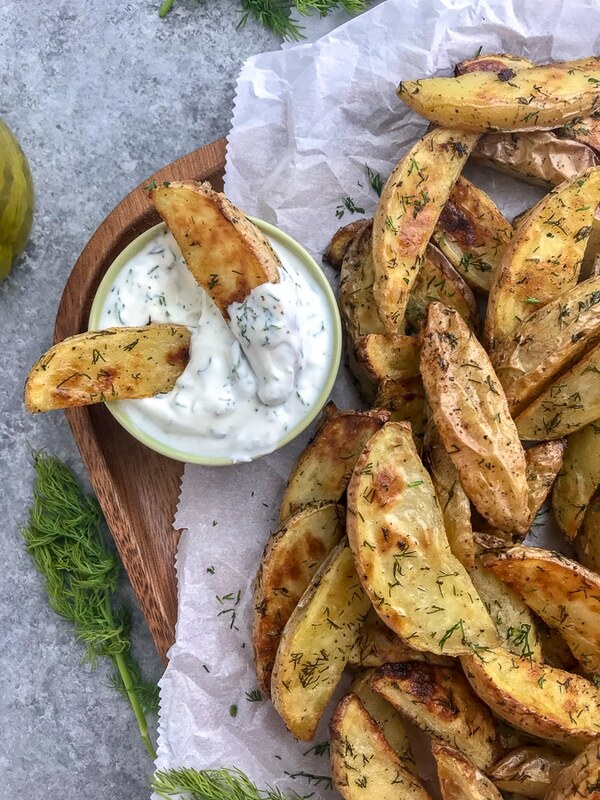 Served with a dill pickle dip, these potato wedges make for the perfect appetizer or side dish this grilling season! 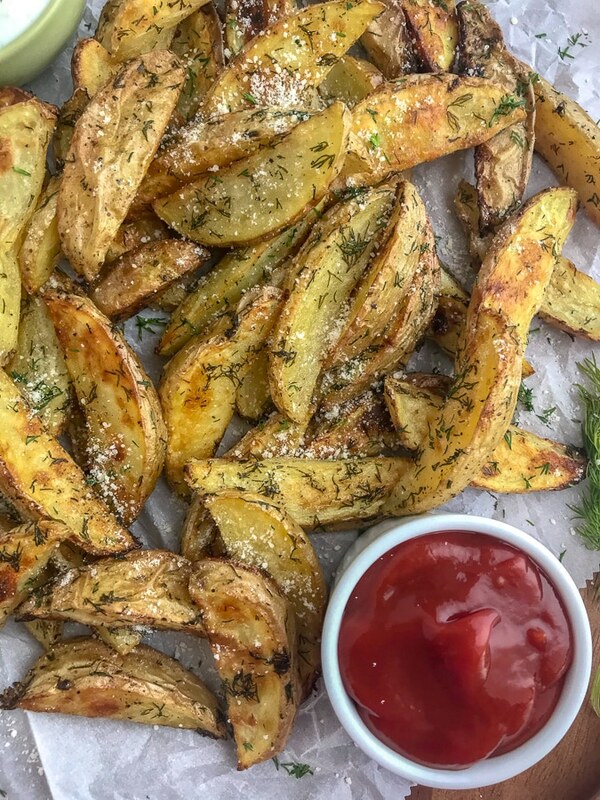 If you’re looking for a new way to spice up or flavor your basic potato wedges or french fries – then you need to try it with dill pickle flavorings! Stop throwing out your pickle juice and start using it to dill-pickle your fries or even use it to brine meats. Adds so much flavor. Dill pickle flavoring? Yep. Never tried it? That’s ok! If you have ever had salt and vinegar or malt vinegar on fries, then the combination of dill and pickle may be right up your taste bud alley. Pickle juice is essentially vinegar after all. The inspiration for this idea came from a trip my husband and I took up to Northern Michigan. We found this cute little restaurant where we indulged in one of the best burgers we have ever had, as well as the yummiest dill pickle chicken pizza. I had never thought to flavor anything with dill pickle before. Mind you, I have had dill pickle chips, but it never crossed my mind to utilize it with one of my own recipes. So, you could say my taste buds hit a light bulb affect after my pizza indulgences! 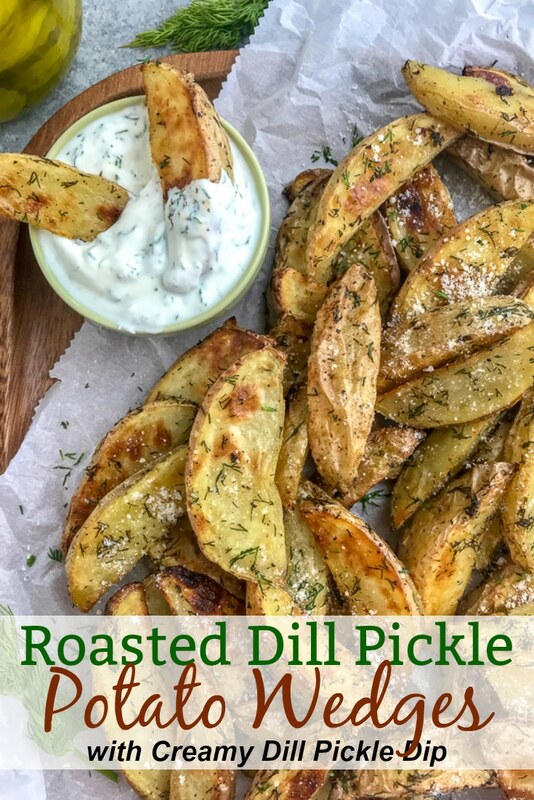 If you have a nearly empty jar of pickles, use that juice (& even the pickles) to make these Roasted Dill Pickle Potato Wedges! That’s it! A simple recipe that requires very few ingredients and is guaranteed to be a hit with you and your guests! I recommend marinating the fries in the dill pickle juice for 2-3 hours, with a minimum of 2 hours. The longer they marinade, the more flavorful they will be. If you’re a huge pickle fan and want even more pickle flavoring, use a spray bottle to add extra dill pickle juice when they come out of the oven. If you don’t have a spray bottle, use a brush. When the wedges are done marinating, drain and pat them completely dry using a few paper towels. It helps to crispy them up if you remove a bit of excess moisture. You can make the creamy dill pickle dip to accompany this or serve it with your favorite condiment: ketchup, mustard, etc. These fries are best served right out of the oven. Herb Scissors – my favorite kitchen gadget! Makes chopping herbs SO simple. I will never go back to a cutting board and knife. Baking Sheets – I’ve always use Wilton and love them! Line them with some parchment sheets with this recipe for easy cleanup! Parchment Sheets – pre-cut parchment paper sheets that you grab and place directly on the baking sheet. No measuring needed. Crispy on the outside and flaky on the inside - with the most delicious dill pickle seasoning! Baked, not fried, making them a delicious, guilt-free indulgence! 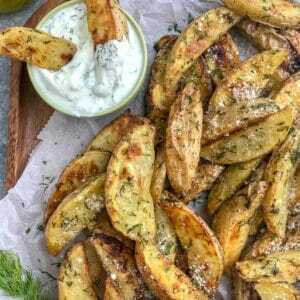 Place the sliced potato wedges into a large bowl or square baking dish and cover with the dill pickle juice. Cover with a lid or plastic wrap and place into the refrigerator to marinade for a minimum of 2 hours, or up to 3 hours. Preheat oven to 425 degrees F. Line a large baking sheet with parchment paper (you may need two prepared baking sheets depending on how many servings you make). Drain the potatoes and pat completely dry with a few paper towels. To the same bowl, add the oil, garlic powder, dill, and salt and pepper. Toss to thoroughly coat the potatoes. Add the wedges to the baking sheet, forming a single layer, making sure that none overlap. Bake for 35-40 minutes, removing to flip after 20 minutes an checking at 30-35 minutes. Baking time will depend on how thickly cut your wedges are. During the last 10 minutes of baking, mix together all ingredients for the dill pickle dip. Taste test and adjust the pickle juice, salt, and pepper to your taste preferences. If you like a lot of dill pickle flavoring, I recommend adding more juice and even 1-2 chopped up dill pickles. Refrigerate any leftover dip. 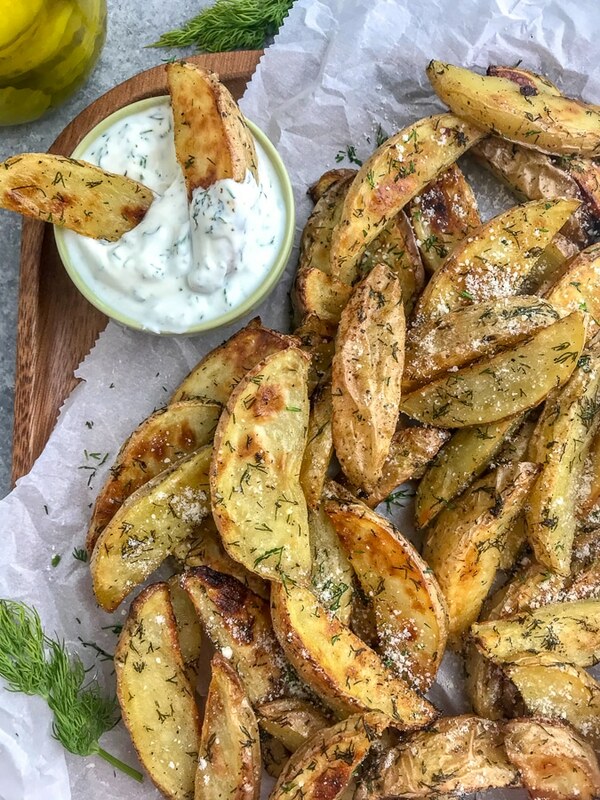 Garnish wedges with additional dill, a spritz of dill pickle juice, and parmesan cheese. Best served fresh out of the oven. If you're a huge pickle fan and want even more pickle flavoring, use a spray bottle to add extra dill pickle juice when they come out of the oven. If you don't have a spray bottle, use a brush. POTATOES: You can use Yukon, Red, or Russet potatoes. Baking times may vary depending on how thickly cut your wedges are. DILL SEASONINGS: Like salt and pepper - add this to your taste preference. If you're unsure of how much you will like, I recommend adding 1 - 1 1/2 tbsp to the potatoes to bake. Add more as garnish if needed. DILL PICKLE JUICE: Same as dill, add this to your taste preference. Some may prefer a hint of flavoring, whereas others may prefer a flavor punch. I fall in the middle, which is what you will find in the ingredients listed above. DIP THICKNESS: The dip is on the thicker side, so if you prefer a thinner dip, you can use half and half or milk to thin it out to your desired consistency. This dip will thicken slightly when refrigerated.